Last week someone posted a link to 30 Red Velvet recipes on Facebook. With my love of all things red velvet I knew I’d love to stuff my face with all of it…..and eventually I will. Another snow day = more baking. The girls and I headed out in the state of emergency (due to an ice storm) to get the stuff we needed. Probably not the smartest thing, but I only had to drive a minute to the nearest food store. I couldn’t decide which recipe I wanted to make, but finally settled on these brownies to start. I also got stuff to make a few other recipes too…just in case we had another snow day the following day (thankfully, we didn’t) because it’s been the norm in Jersey this winter. The girls and I got right to work……because there are a few different layers in this recipe and it seemed a bit time consuming. 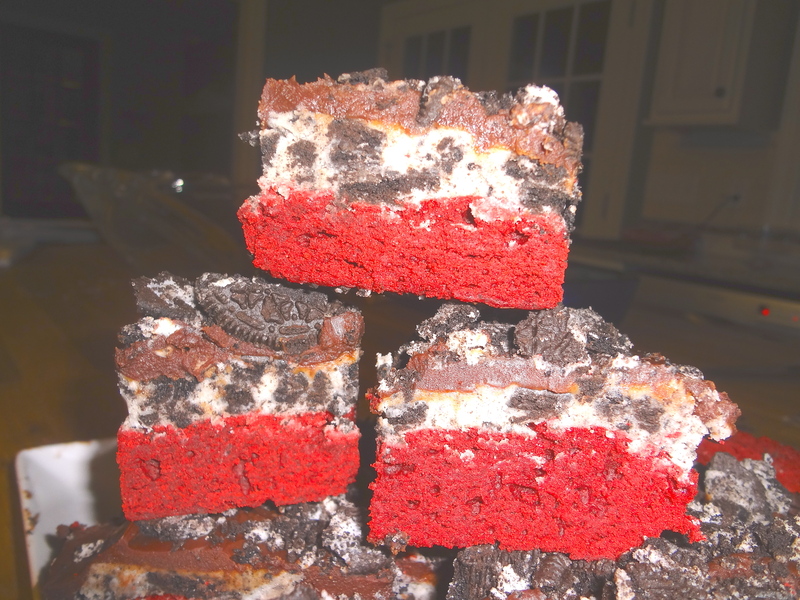 This recipe has a red velvet brownie layer, an Oreo frosting layer, a chocolate gnache layer all topped with more crumbled Oreos! DELICIOUS! Not exactly a recipe you’d eat when you’re watching your calories…but everything in moderation, right? Line an 8×8 baking pan with aluminum foil, leaving enough overhang on the sides to lift the brownies out of the pan. Set aside. Make the brownies: In a small bowl, beat the 2 eggs together. Set aside. Stir in 1 cup sugar, 2 teaspoons vanilla extract, cocoa powder, salt, food coloring, and vinegar. Mix each of those ingredients into the batter in that order. Pour the brownie batter into prepared baking pan. Bake the brownies for 22-24 minutes or until a toothpick inserted in the middle comes out mostly clean, with a few small moist crumbs. Allow the brownies to cool at room temperature for 30 minutes, then transfer to the refrigerator to cool completely. Make the frosting: With a handheld or stand mixer beat the butter until light and creamy – about 1 minute. Add the confectioners’ sugar and 2 Tbsp cream, beating on medium until creamy. Add 1 more Tbsp cream until the frosting is spreadable consistency. You want it to be thick so that the frosting layer stays neat when you cut into the brownies. Lift the cooled brownies out of the pan and spread them with the frosting. Stick them into the refrigerator as your prepare the ganache. You want the frosting to slightly chill on the brownies. Make the ganache: Break up the chocolate into small pieces in a medium bowl. Heat the heavy cream until boiling, either in the microwave or on the stovetop. Pour boiling cream over the chocolate and stir until the chocolate is melted and smooth. Cut in the butter, one small piece at a time, and stir until smooth. Chill the gnache for a little bit in the fridge until it’s thick enough to spread. Chill for at least 30 minutes before cutting. Cut the brownies into squares, wiping your large knife off with a wet paper towel between cuts so that the layers stay neat. Thanks, Sally! These were amazing!!! Wow! I love everything red velvet and oreos are my favorite cookie so this has won me over!